Heart disease is a cold faced killer. It is the leading cause of death among both men and women in the United States. The good news is though, it is a killer that can be stopped. The catch however is that you are the only one who can stop this mass murderer. In honor of Heart Health Month, we are going to tell you exactly how you can take control of your heart health and protect yourself from such a grave fate. Life is all about choices. Each and every one of us was blessed with free will, which means that we are free to make our very own choices in every matter of our personal lives. Sometimes we don’t always make the best choices though and sometimes those bad choices can have detrimental consequences. This is often the case with heart-healthy verses heart-harming choices. The following questions will help you determine if you are at a heightened risk of a major life changing or potentially life ending cardiac event. These are the factors that affect your heart health and as you can see many of them involve choices. Do you engage in at least 30 minutes of physical activity a day? Are you regularly stressed out? Do you eat a lot of high saturated fat foods, such as processed meat, marbled cuts of beef, packaged cookies and desserts? Do you eat a rainbow-colored assortment of fruits and vegetables every day? Do you have high blood pressure? If yes, is it managed? Do you have high cholesterol? If yes, is it managed? While there are certain factors that are out of your control, such as family history, there is quite a lot that is completely under your control. Let’s further examine one of the simplest heart health factors, physical activity. Thirty minutes a day of physical activity doesn’t necessarily mean that you have to go to a gym or even do it all at once. It can be as simple as taking a 30-minute bike ride around your neighborhood, two 15-minute walks with your dog, or three different 10-minute activities, such as a 10-minute morning yoga practice, a 10-minute post-lunch walk, and a 10-minute outside play session with your kids after work. The more you move the better you will feel physically and emotionally. And the endorphins that are released during physical activity also act as a natural stress buster, so you’re tackling two heart healthy factors at once. Make this easy change today. Interesting fact: According to a Harvard Study, watching two hours of television a day increases your chances of developing heart disease by 15%. Incorporating more movement into your daily life will result in a healthier, happier, and less stressful life, which in turn will greatly reduce your risk of developing heart disease. Next week, we will further examine the importance of diet and what heart healthy foods you should be eating every day. For those of you who are just tuning in now, Parker Wellness is focusing on what Hana Matt, therapist and world religion teacher at Berkeley, has outlined as the 20 proven ways to joy. We will be breaking down these 20 ways over the course of the next two or three months. The goal is to learn the simple ways in which you can bring consistent joy into your life. You might be surprised to learn that there is actually a neuroscience and a wealth of scientific research dedicated to the broad emotion of happiness. There are all sorts of different numbers out there that suggest the recommended amount of exercise one needs to do every week in order to be considered healthy. However, there are a lot of factors that go into what that real number should be for an individual. Remember everyone is different. To make it easy though and just to have a basic base, you should aim for around 150 minutes of moderate exercise or 75 minutes of vigorous exercise per week. You can of course do any numerical combination of the amount of moderate and vigorous exercise. It is important to abide by and make adjustments for your body’s own limitations and special needs. 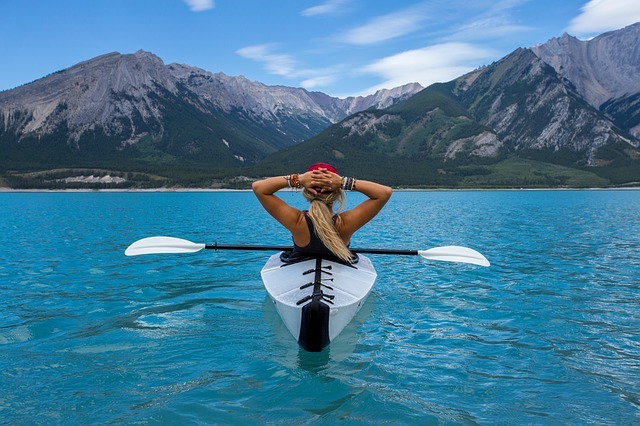 Some examples of moderate exercise would be brisk walking, light bicycling, doubles tennis, yoga, and paddle boarding. 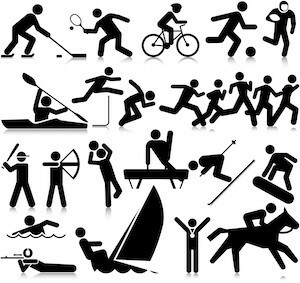 Vigorous exercise would include activities like hiking, jogging, singles tennis, and circuit weight training. When deciding what you want to do for exercise, you can be as creative or conventional as you would like. Don’t forget that common household activities like mowing the lawn, cleaning the house, and gardening are also forms of physical activity. While exercise is good for your physical health, it is also a vital component in your emotional and mental health, as well. If you are not an active person, you may have not yet felt the euphoria that often comes from a good sweat, a competitive game, an adrenaline pumping activity, or a mindful yoga type flow. There is no time like the present! Doing daily activities that release those “joy chemicals” in our brains inevitably are necessary for improving and helping to obtain consistent daily happiness. The first step is finding an activity or activities that you actually enjoy doing. If you are not someone who likes to go to the gym, don’t choose a form of exercise that requires your presence there. If you love the ocean, then try out the many amazing ocean related activities, such as swimming, paddle boarding, surfing, or kayaking. If you find peace in a forest, then take up hiking, rock climbing, or mountain biking. If you are looking to quiet your mind, then try a yoga class. And don’t forget to mix it up and keep it interesting. You are more likely to stick to an exercise plan if you actually enjoy the plan. There is no right or wrong. This is a personal decision to get moving in whatever way suites you best. All movement is good movement! 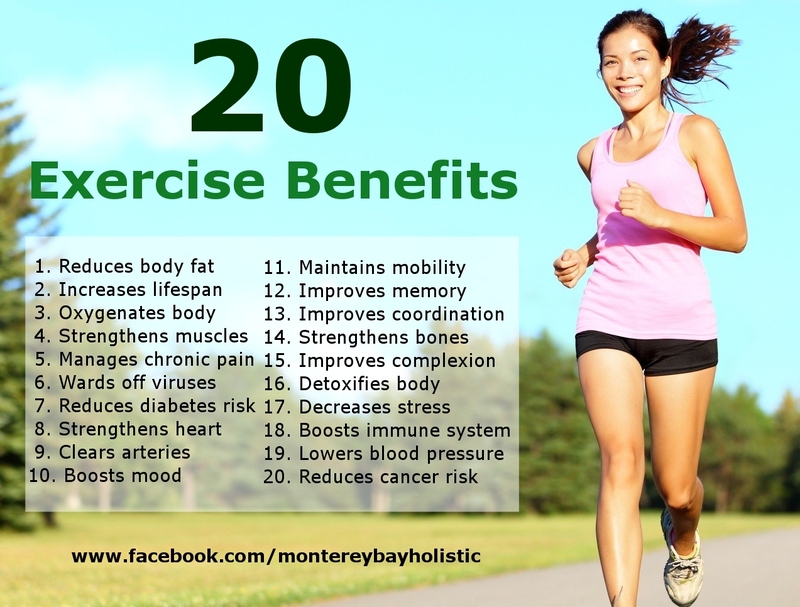 Below is also a little reminder of some of the other amazing benefits of exercise. Thanks for sharing a smile with us! Stay tuned for more on Friday.